"The idea that the government can send signals through the wall of your house to figure out what's inside is problematic," said Christopher Soghoian of the American Civil Liberties Union. "Technologies that allow the police to look inside of a home are among the intrusive tools that police have." Reminiscent of the heat-seeking extraterrestrial in the Hollywood movie ‘Predator,’ the device, known as the Range-R, uses radio waves to detect the exact location of movements, even breathing, from more than 50 feet away. The Range-R, made by arms company L-3 Communications, displays three-dimensional movement detection from the other side of a wall, indicating how far away any motion is, though it does not offer a picture of the action inside. L-3 Communications said it has sold approximately 200 Range-R devices to 50 law enforcement agencies for about $6,000 each. Federal records indicate that the US Marshals Service began purchasing the radars in 2012, according to USA Today, and have been spending $180,000 on them ever since. The device’s use, though, went unnoticed until December, when a federal appeals court in Denver discovered that police officers had used the radar device without a search warrant to enter a house in order to find a truant parolee. The panel judges warned, "the government's warrantless use of such a powerful tool to search inside homes poses grave Fourth Amendment questions." While use of the device alarmed the judges in that case, it was first time an appellate court had even referenced the technology. US Justice Department spokesman Patrick Rodenbush said officials are reviewing the court's decision, adding that the Marshals Service "routinely pursues and arrests violent offenders based on pre-established probable cause in arrest warrants" for major crimes. According to USA Today, the Justice Department is actively funding development of systems that aim to map building interiors in order to find people inside. The devices, according to the report, were first used during the wars in Iraq and Afghanistan, marking yet another tool fostered for US military uses and later passed off to US law enforcement for use in everyday policing situations. The US Supreme Court has generally barred the police use of such technology to monitor the inside of one’s home without a warrant. 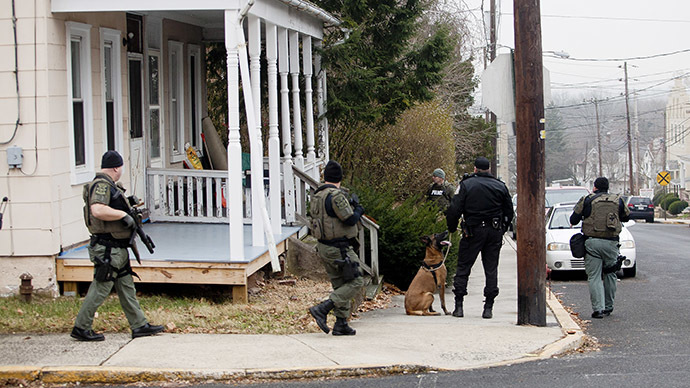 In a 2013 case that limited use of drug dogs to sniff the exterior of homes, Justice Antonin Scalia reaffirmed the Fourth Amendment as "the right of a man to retreat into his own home and there be free from unreasonable governmental intrusion."